Sea glass is made when glass is discarded in salt water, and smoothed by tumbling against rocks and sand. In a process called hydration, water filters out lime and soda from the glass, leaving a frosted surface where it was once shiny and translucent. sea glass are found in the northeast United States, California, northwest England, Mexico, Hawaii, Puerto Rico, Nova Scotia, Australia, Italy, and southern Spain. To produce the different colors of glass, various minerals were ground up and melted with the glass (cobalt to make blue, metallic gold for deep red, silver for orange, selenium for pink). Some of the minerals are more expensive and therefore the colors of glass they produce are rare. Walking along almost any beach, it is common to find clear, brown or green sea glass – usually from beer or wine bottles. It is very special to find red and pink because these shades are now rarely produced. Red sea glass most often started out as car brake lights, warning lights on boats, lanterns, lamps, and stained glass. Orange is not well matched with other colors; therefore orange glass was not widely manufactured and also has a low demand for use as sea glass jewelry. Orange sea glass was sometimes used with tableware. Sea glass enthusiasts are also discovering sea glass tinted purple or amethyst because of a sun activated chemical called manganese – which was used to counteract the natural green tint of glass to make it clear. Sea glass is most often compared to precious gems in rarity and value. Just like gems, sea glass is used to make jewelry. It can also be used as an accent to brighten your home. There are four major categories within sea glass pieces: craft-grade A and B and jewelry-grade A and B. Jewelry grade A is worth the most and the highest in demand. 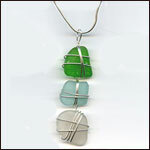 Massachusetts Bay Trading Company carries a gorgeous line of sea glass jewelry. Valerie Gates’ sea glass comes from Cape Cod and her SeaGlassWear Jewelry comes in a wide array of sizes, colors and pieces from earrings to necklaces and bracelets. Are you interested in finding your own sea glass? Some beaches are better than others if you are in search of this treasure. Specifics like wave height (1-2 feet minimum), the width of the beach (must be more than 25 miles) and the population and history of the area all affect your chances of finding sea glass. The best time to look is during low tide after a storm. Here are locations around BOSTON where sea glass can be found. ~ by massbay66 on March 8, 2011.